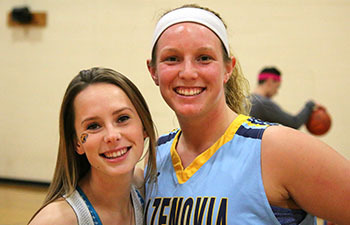 Cazenovia College will be hosting its first annual You, Me, We: Empower and Succeed event on Saturday, February 3, 2018 in honor of National Girls & Women in Sports Day, geared toward middle-high school female athletes and one influential female in their life. This event will be held from 11:00 a.m. - 1:00 p.m. in the Cazenovia College Athletic Complex Lower Gym, located on Liberty Street in Cazenovia. There will be a Women's Basketball game following the event that all attendees are welcome to stay for. The You, Me, We: Empower & Succeed event is one of more than 1,000 events taking place across the country for National Girls and Women in Sports Day. Congress has proclaimed this national day each year since 1987. The day is devoted to recognizing the progress of girls and women in sports, and the benefits that sports and fitness activities can bring to the lives of all girls and women. The day is organized nationally by the NGWSD Coalition; to learn more, visit www.NGWSD.org. Female Student-Athletes and administrators from Divisions I through III will join together to discuss how to achieve success in both athletics and in life, through topics such as goal setting, motivation and facing adversity. This panel of individuals is made up of Athletic Department staff and student-athletes from colleges in the Greater Central New York Area encompassing all three divisions. "We're very enthusiastic about this event," noted Alena Anthony, senior woman administrator and strength & conditioning coach at Cazenovia College. "It is so important for young women and those that support them to feel confident that they can achieve their goals." Tickets for the event are $10, which includes admission for the event and basketball game to follow for the athlete and her one influential female. For more information on this event, please call Alena Anthony at 315-655-7327 or e-mail amanthony@cazenovia.edu. Proceeds from this event will benefit the Women's Sports Foundation.